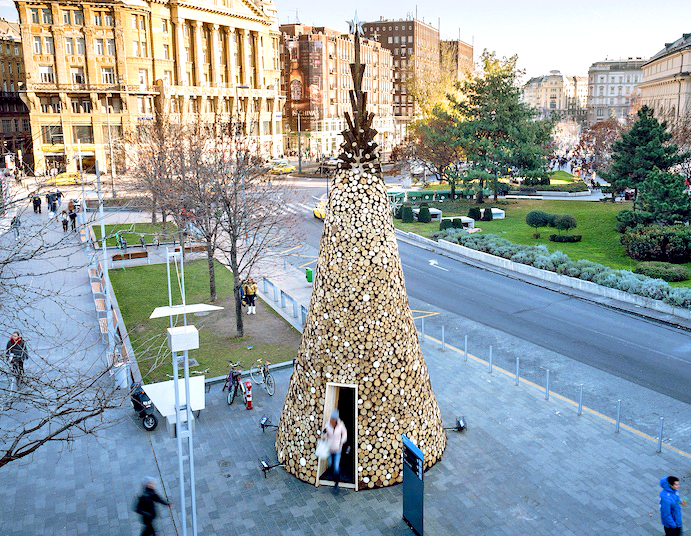 For the second year in a row, Hungarian design firm Hello Wood created a gorgeous Christmas tree that not only looks great day and night, but is also designed to give back to the Budapest community at the end of its lifespan. True to Hello Wood's style, the conical Charity Tree is primarily made from timber. The structure was then filled in with 33,000 pounds of stacked sawn logs. The 5,000 pieces of firewood will be distributed to families in need once the tree is taken down on the Twelfth Night after Christmas. Built over the course of five days, the Charity Tree was created by Hello Wood in collaboration with Design Terminal and the Hungarian Interchurch Aid. White paint was applied to the circular faces of select logs as a nod to the Christmas ornaments that punctuate a fir tree. To give the tree a more dynamic look, the firewood placed on the tree’s upper quarter are angled upwards and elongated, with the final piece serving as the vertical base for a metal star. The 36-foot-tall hollow tree also features a doorway, which leads visitors into a “chapel-like sacred inner space.” Log benches provide seating inside. 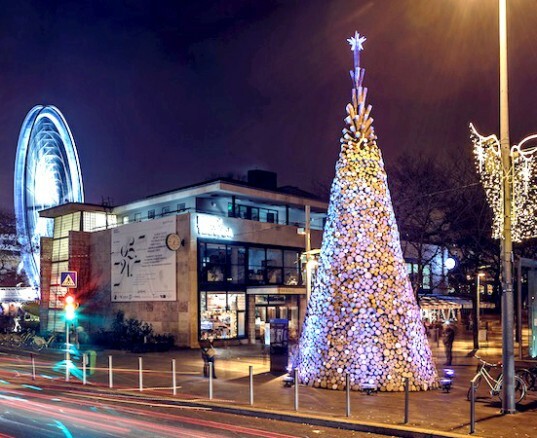 At night, the Charity Tree is dramatically lit from the ground up with lighting effects by Philips Hungary. For the second year in a row, Hungarian design firm Hello Wood created a gorgeous Christmas tree that not only looks great day and night, but is also designed to give back to the Budapest community at the end of its lifespan. True to Hello Wood's style, the conical Charity Tree is primarily made from timber - and the structure is filled with 33,000 pounds of stacked sawn logs that will be distributed as firewood to families in need once the tree is taken down on the Twelfth Night after Christmas. White paint was applied to the circular faces of select logs as a nod to the Christmas ornaments that punctuate a fir tree. The timber structure was first constructed and then filled in with 33,000 pounds of stacked sawn logs. The 36-foot-tall hollow tree also features a doorway, which leads visitors into a "chapel-like sacred inner space." At night, the Charity Tree is dramatically lit from the ground up with lighting effects by Philips Hungary. The 5,000 pieces of firewood will be distributed to families in need once the tree is taken down on the Twelfth Night after Christmas. The Charity tree reaches a height of 36 feet. View of the underlying timber structure.